★ Light & Unbreakable & Stackable - Comparing with Ceramic or Fiberglass planters, our resin clay planters are 30% of the weight of ceramic items and can be well stacked on the pallet. You will save shipping cost. ★ Outdoor Use - Resin clay flower pot provides great growing conditions for plants as its natural porosity allows the pot, compost & plant roots to "breathe" whilst assisting in reducing the likelihood of overwatering. The color is predominantly pale grey. 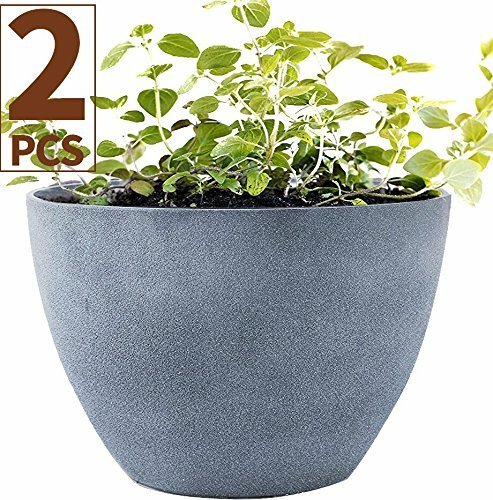 ★ 5-year Service Life - Comparing with plastic planters, our planters are stronger than plastic, and with long service life, it will not break in more than 5 years.Elegant and unique design will bring real natural effect on the planters. UV resistant, frost resistant which plastic planters don't have. ★ 100% SATISFACTION - We provide full refunds & returns if there's any problem after receiving the product.